For the former government agency, see Norwegian State Railways (1883–1996). On 1 December 1996 the largest structural change in Norwegian railway history in the 20th century occurred. The old Norwegian State Railways was split into three separate governmental agencies. The ownership, maintenance and construction of the track was transformed to the newly created government agency Norwegian National Rail Administration while a new Norwegian Railway Inspectorate was created to supervise all railway operations in the country. NSB was renamed NSB BA and created as a limited company, wholly owned by the Ministry of Transport and Communications. Also, NSB was made a concern, with NSB Biltrafikk (now Nettbuss) and NSB Eiendom (now ROM Eiendom) made subsidiaries of NSB. In 1998 the new Oslo Airport, Gardermoen opened, replacing the old Oslo Airport, Fornebu that had been too small since the 1980s. Part of the political compromise to build the new airport was a twofold consequence for NSB. First of all it was decided that the new airport was to have an as environmentally friendly ground infrastructure as possible, resulting in the decision to build a high speed railway on the 56-kilometre (35 mi) stretch from Oslo Central Station to the airport, which would only take 19 minutes. But at the same time it was a political demand that the new airport not cost the tax payers any money, and it was decided that the entire construction was to be financed with loans. The result was that the airport was to be financed, built and operated by the Civil Aviation Administration subsidiary Oslo Lufthavn AS while the rail connection was to be financed, built and operated by the NSB subsidiary NSB Gardermobanen. But problems arose during the construction of the Gardermoen Line because of a leak in the tunnel Romerike Tunnel, resulting in major budget overruns and a delay in the opening of the tunnel. Still, Norway's first high speed railway line opened on time on 8 October 1998 at the same time as the new airport, though Romeriksporten was not opened until 22 October 1999, more than a year after its scheduled opening. The service is operated using 16 custom built Class 71 electric multiple units, with a capacity for 168 passengers and maximum speed of 210 kilometres per hour (130 mph). NSB tried to modernize itself in the late 1990s through the acquisition of new rolling stock and a new brand image. The first stock to be delivered were 22 El 18 electric locomotives. These were to take over the passenger train traffic in Southern Norway while the El 16s and El 14s were moved to the freight division and the El 17s were scrapped, relegated to shunting or sold to the Flåm Line. The new locomotives were capable of speeds up to 200 kilometres per hour (120 mph). For the diesel lines NSB attempted to buy 12 Di 6 from Siemens, but had to return them after they failed to operate sufficiently in the Northern Norwegian cold. NSB also decided to re-brand itself with three district brands: NSB Signatur (express trains), NSB Agenda (regional trains) and NSB Puls (local trains). At the same time NSB ordered new electric multiple units, first of all for the new Airport Express Train service, Class 71. This was followed up with 16 new Signatur trains of Class 73 that were to be used on the express services on the Bergen Line, the Dovre Line and the Sørlandet Line and equipped with tilting technology. This was an attempt to create a high speed railway service using existing rail track, though the operating times between Oslo and the termini were only reduced by about 10 minutes. These trains were painted blue and grey, and were the first non-red trains to be operated by NSB in decades. At the same time NSB announced the introduction of the Agenda concept, that was to replace the NSB InterCity Express services and the diesel services. 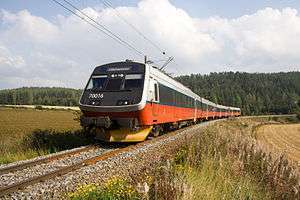 While the Class 70s were simply repainted, the diesel services on the Nordland Line, the Rauma Line and the Røros Line were upgrades with 15 new Class 93 units in 2001, though criticized for lack of comfort, have increased the speed on the railways. NSB also discontinued night train services on Raumabanen and Rørosbanen. NSB also received, starting in 2002 36 new electrical local trains, Class 72. These were painted grey/green (for the use of the brand name Puls) and were put in the Oslo Commuter Rail and Jæren Commuter Rail. NSB has now discontinued the use of brand names on its rail products. By 2002 the Bondevik's Second Cabinet wanted to further deregulate the Norwegian railway sector, and made NSB a limited company NSB AS on 1 July. NSB had been through a process of making the company more of a corporation, with the IT section made the subsidiary Arrive and the maintenance transformed to Mantena. NSB also purchased part of the Swedish Tågkompaniet while the old freight train section NSB Gods was transformed to CargoNet. 45% of the subsidiary was then sold to the Statens Järnvägar successor Green Cargo. In 2004 the government also split NSB Gardermobanen in two, deleting the companies debt, transferring the track it owned to Jernbaneverket and the train operations to a new, government-owned enterprise, the Airport Express Train. NSB operates with three main types of passenger rail transport: intercity trains, regional trains and commuter trains. Long-haul electric passenger trains services are offered on the Bergen Line, the Dovre Line the Sørland Line. The four day trains are operated with Class 73 electric multiple units (formerly branded as Signatur) or with traditional locomotive hauled trains (electric locomotives El18 and coaches Class 7). A night train service with WLAB2 sleeping coaches is also offered on these lines. On the Nordland Line between Trondheim and Bodø NSB operates using diesel locomotives Di4, making it the only line still serviced by such for regular passenger service. NSB has two regional rail services. All regional trains are to receive the new livery of red and grey. NSB has previously used the brand name Agenda on its regional services. Regional services use Class 70 (Skien–Lillehammer) and Class 73b (Oslo S – Halden – (Gothenburg)). The service is provided hourly along the Trunk Line, the Vestfold Line and the Østfold Line. The trains running between Lillehammer and Skien serve Oslo Airport, Gardermoen, providing an alternative to the Airport Express Train. Around the cities of Arendal, Bergen, Oslo, Skien, Stavanger and Trondheim NSB operates commuter train services using Class 69 and Class 72 electric multiple units and Class 92 diesel multiple units. The services usually have hourly or semi-hourly frequency. NSB tried using the brand name Puls for the commuter trains, and have painted some of the trains green. The Puls brand has been discontinued. The Trøndelag Commuter Rail: Lerkendal–Trondheim–Steinkjer (Nordland Line) with diesel Class 92. Services on Gjøvik Line were in 2005 transferred to NSB Gjøvikbanen after the NSB subsidiary had won a public tender bid for a ten-year public service obligation contract with the Norwegian Ministry of Transportation and Communication. The Norwegian Minister of Transportation and Communications, Liv Signe Navarsete (Centre Party), has announced that the present government (as of 2006) will discontinue the previous government's announcements to put more rail line operations on public tender. The Norwegian passenger train division has a fleet of 36 Class 72 and 82 Class 69 electric multiple units (EMU) and 14 Class 92 diesel multiple units (DMU) for commuter services. The company has a further 22 Class 73 and 16 Class 70 EMUs and Class 93 DMUs for regional and intercity trains, which are also provided by 22 El 18 and 5 Di 4 locomotives which haul Class 5 and Class 7 passenger cars. NSB receives subsidies to operate unprofitable route from its owner, while services on the Gjøvik Line have been made subject to public service obligations, which is operated by NSB's subsidiary NSB Gjøvikbanen. During the 1990s NSB modernised their rolling stock, expanding their fleet of multiple units and retiring many of the traditional locomotive-hauled trains. Most of the locomotives were sold to the freight company CargoNet AS, but the models El18 and Di4 remain to haul passenger trains. Some of the new trains were plagued with troubles, in particular a brand new Class 73 derailed (fortunately at low speed) at Nelaug in 2000 because of an axle breaking due to metal fatigue. As of 2005 however, these trains have been performing satisfactorily. In August 2008, NSB announced it had ordered 50 new five-car electric multiple units of the Class 74 and 75. These will be used for local service in the Greater Oslo area (24 sets) and also regional service in southern Norway (26 sets). The delivery is scheduled for 2012 but delayed because of accident during testing, by that time much of the rail network is expected to be upgraded to double track, enabling an increase in frequency. The contract which is worth approximately 840 mill. Swiss francs gives NSB an option to buy an additional 100 sets. These trains have been specifically modified to operate in Norwegian climate and have a maximum speed of 200 km/h (120 mph). 5 Di 4 class diesel locomotives, used mostly on Nordlandsbanen. 9 El 17 class electric locomotives, three used for shunting and six run on Flåmsbana. 22 El 18 class electric locomotives, used on all main electrified lines. 80 Class 69 class 2-car or 3-car commuter trains, used around Oslo, Bergen and Arendal. 16 Class 70 class 4-car intercity (medium distance) trains, used around Oslo. 36 Class 72 class 4-car commuter trains, used around Oslo and Stavanger. 16 Class 73 class 4-car long-distance trains, used on Dovrebanen and Sørlandsbanen. 6 Class 73b class 4-car intercity version of the Class 73 used on Østfoldbanen. 50 Class 74 intercity trains and Class 75 commuter trains, based on the Stadler FLIRT are being introduced. With the first for profit operation on May 2, 2012. 14 Class 92 class 2-car trains used for commuter services around Trondheim, and on Rørosbanen. 15 Class 93 class 2-car trains used on long distance and intercity services on Rørosbanen, Nordlandsbanen and Raumabanen. Also known as Bombardier Transportation Talent BR643 Diesel Multiple Unit. 3 Y1 used until 2015 on Bratsbergbanen between Skien and Notodden. The non-motorized passenger carriages in operation are the B3-series (the oldest), B5-series and B7-series. The B5- and B7-series are in service on long distance express trains while the B3-series in green color are used in tourist trains on Flåmsbana (Myrdal-Flåm). ↑ Tor Wisting. "Norges Statsbaner AS". Store norske leksikon. Retrieved October 1, 2016. ↑ Berglund, Nina. "NSB invests in new trains". Aftenposten. Retrieved 2008-08-21. ↑ Archived September 27, 2013, at the Wayback Machine. ↑ Solholm, Rolleiv. "New trains for Norwegian Railways". The Norway Post. Archived from the original on June 23, 2009. Retrieved 2008-08-21. ↑ "Første Flirt med passasjerene - VG". Vg.no. Retrieved 2015-10-29.